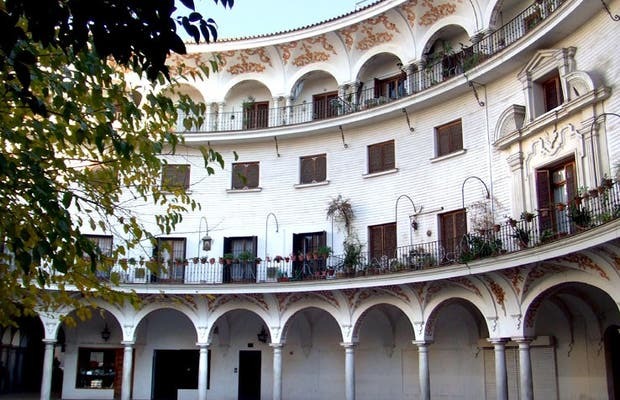 The Plaza Cabildo in Seville is one of the most typical and beautiful places in the city. It is a place that, on work days breathes tranquillity despite being located in the historical centre opposite the cathedral. All around you can find good local restaurants to eat well at a reasonable price, within medium-high margins. On Sundays, the tranquillity changes as in the morning there is a flea market for antiques, stamps, coins and collectibles in general that transform the square into a hive of activity for experts and collection enthusiasts, it’s not in vain that there are also a number of locales in the square dedicated to all types of collections and antiques. If you like collecting moments, photos, corners, stamps, coins or any other object there is no better place than the Plaza del Cabildo in Seville. Its architecture is fantastic surrounding the square with a semicircle of housing. The sun, a friend of Andalusia, joins every Sunday so that the merchants and the buyers can gather around the square to enlarge their collections.